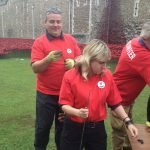 Back in September 2014 I was lucky enough to be asked if I would like to bring a team along to The Tower of London to plant what turned out to be an experience of a life time. My brief was to arrange a team to come to the Tower to plant some ceramic poppies in the moat of the Tower of London. I didn’t know much about this project, all I knew, it was to mark the 100 years since the first full day of Britain’s involvement in the First World War. So I arranged a team of 11 which including Scout Leaders, secondary school teachers and my old Radio station boss and his wife. We gathered at a secret door at the back of the tower to be given our instructions for the day and shown our plot for planting. 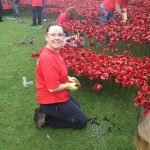 In my team we split ourselves into 2 teams, 1 section would assemble the ceramic poppies and the other section would plant them in our designated area, after appox 15/20minutes we swapped roles and this carried on like this till our shift was completed. During the planting of the poppies we all agreed that we couldn’t quite imagine what our “area” would like look. We weren’t told exactly where to plant each poppy, we were just told this is your area, plant some tall and lower poppies and don’t go out of your marked area. 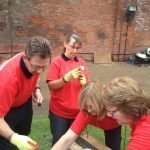 Being on the ground it was hard to visualise the ceramic poppies that we had just planted. I kept looking up to the general public looking down on us, some crying, some smiling, lots of folk taking photos of the poppies that had already been planted from previous teams aswell as taking photos of us planting them. 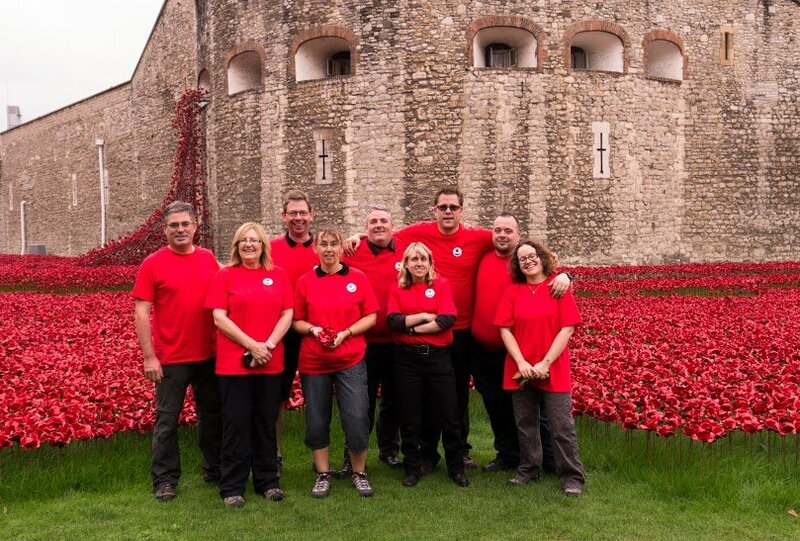 My team wondered around the moat, took time out to admire the poppies. We then wondered back to the meeting point, handed in our gloves, safety glasses and high vis jackets, we said our goodbyes to each other and went our separate ways. Us Scout leaders were very hungry, I suggested we headed to a pub close to St Catherine’s Dock- home of the Queen’s Golden Barge. We ordered our drinks, argued what we would all have for our main meals. The food arrived and we stuffed our faces with lovely tasty food. 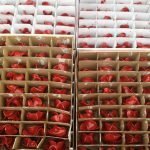 After the project was finished and dismantled, the general public was able to purchase an actual ceramic poppy which was planted at the Tower of London. 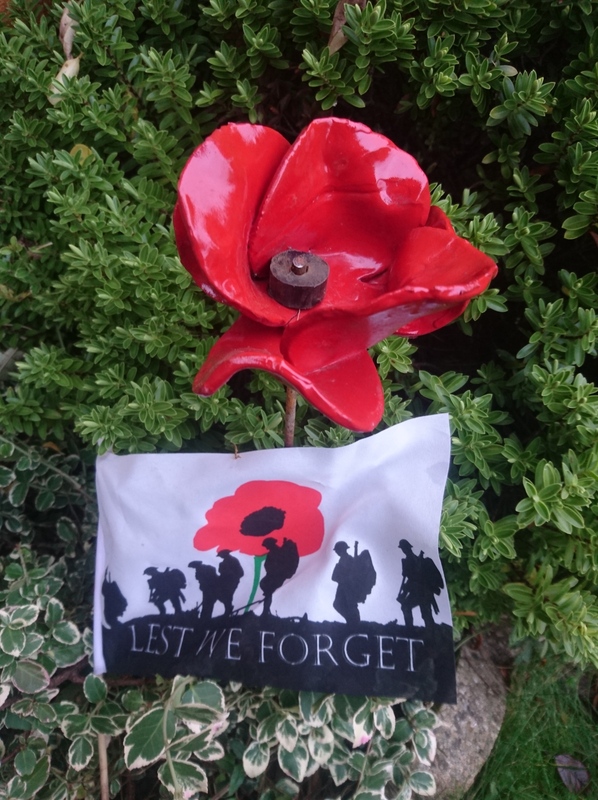 I ordered one online and to this day I plant it in my back garden for Remembrance Sunday “week”. I then store it away for the rest of the year.